I guess, in the end, it comes down to how you like your blues-rock. After ten studio albums (this is his eleventh), four live albums and three live DVDs there’s obviously a market for what Joe Bonamassa’s peddling out there, and it’s a market that was strong enough to vault this album as high as #2 on the U.K. Albums chart. That doesn’t mean as much as it did once upon a time, but still counts as a significant achievement indicating a fair degree of consumer recognition. That U.K. chart action may also have something to do with the fact that Bonamassa cites the British and Irish re-interpreters rather than the Afro-American originators as his primary influences, so we’re talking Jeff Beck, Jimmy Page, Eric Clapton, Paul Kossoff, Peter Green and Rory Gallagher rather than Muddy Waters, Robert Johnson and T-Bone Walker (though he does acknowledge B.B. King). But while he boasts a fairly impressive curriculum vitae, including appearances with B.B. King, Buddy Guy, Robert Cray, Joe Cocker, Paul Rodgers, Gregg Allman, Steve Winwood, Warren Haynes, Eric Clapton, Derek Trucks, and Jack Bruce, Driving Towards the Daylight (which arrived on the doorstep as a freebie associated with a Rhythms magazine subscription) won’t be prompting too much credit card action on Hughesy’s part. Heavy on covers rather than originals (an eight-three scoreline rather than the seven-four cited in some quarters since Somewhere Trouble Don't Go is a Buddy Miller rather than a Bonamassa composition) we’ve got some pretty standard blues-rock, tidy enough with plenty of punch in the production. Kevin Shirley has worked with the Black Crowes, and Aerosmith, so no surprises there and he’s done seven albums in six years with Bonamassa so he knows his stuff and his artist. Of the originals Dislocated Boy is a fairly standard rifferama that thunders along but doesn’t really go anywhere, the title track delivers a fairly standard weary road warrior power ballad and Heavenly Soul is rather light on for both ingredients in the two word title. Robert Johnson’s Stones in My Passway gets a solid going over with a riff that verges on the sledgehammer side of things. The best part of Who's Been Talking? 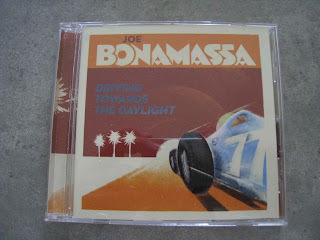 is the Howlin’ Wolf instruction to one of the participants in The London Sessions that precedes Bonamassa’s take on it. Willie Dixon’s I Got All You Need is a fair collection of strutting blues cliches that’s more or less surplus to requirements. It would’ve worked better with someone like Howlin’ Wolf or Muddy Waters doing the bragging, Bonamassa comes across as earnestly entreating rather than issuing a statement of carnal intent. Bernie Marsden’s A Place in My Heart gets a respectful a power ballad treatment along the Gary Moore lines, Bill Withers’ Lonely Town Lonely Street is transformed into fairly standard blues-metal sludge, Tom Waits’ New Coat of Paint delivers a touch of light and shade and Buddy Miller’s Somewhere Trouble Don't Go doesn’t really succeed in going anywhere apart from delivering a bit of electric guitar sleight of hand and Jimmy Barnes’ Too Much Ain't Enough Love has a Barnes vocal, and with that observation made I rest my case. Overall, Driving Towards the Daylight is a workman-like effort that will undoubtedly go down well with the appropriate demographic but I’ve heard a swag of this kind of material over the years and to me there isn’t enough to differentiate what’s on offer here from the rest of a fairly well saturated market.